The Full Eleven-Pack of Syncrota Digital Graphics at one discounted price (save over 30%)compared with buying the images individually. Four Rivers: The Four Rivers graphic displays the many and varied correspondences in nature and science to the Five Platonic solids. This is a large hand-created high-definition quality graphic ideal for printing as a poster and measuring around 14000 by 9900 pixels at 300dpi. 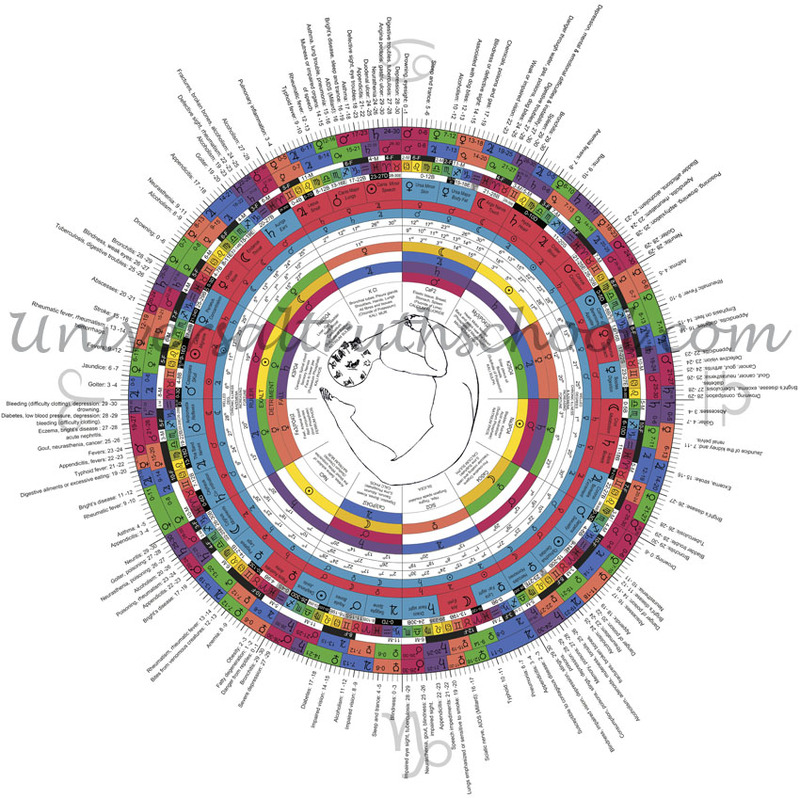 Syncretism Wheel: The Syncretism Wheel graphic Syncretizes all the key Philosophical, Astrological, Astronomical, Medical, Sacred Geometry and Theological sciences, and much more. 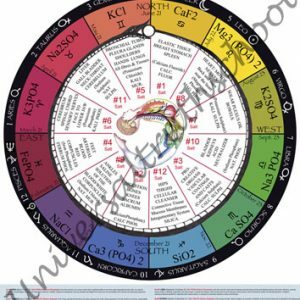 The Syncrota Wheel: detailed astrological chart by Sonia Bonacci: Syncrota is the all purpose Astrological chart of charts incorporating and syncretising much astrological information, including Medical Astrology and Bio Chemical. 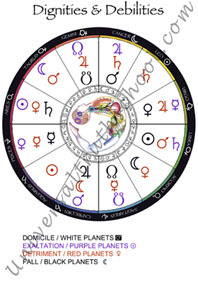 Accidental Dignities: The accidental dignities chart shows how the planets are strengthened or weakened in relation to the houses. 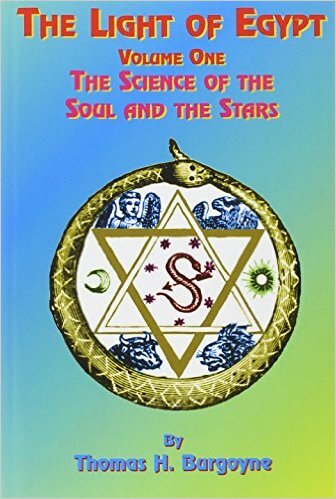 It also shows the meanings of the houses and in which manner they influence the planets. 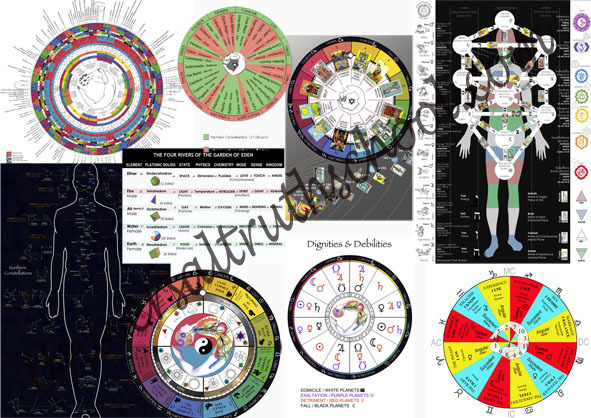 Essential Dignities & Debilities: The Essential Dignities chart shows the ideal positions for the planets in relation to the signs. The two dignities are ‘domiciles’ and ‘exultations’, the two debilities are ‘detriment’ and ‘fall’. 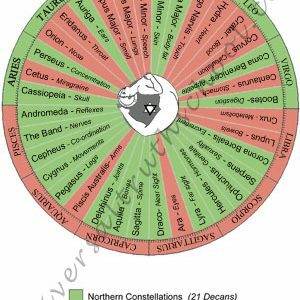 Decans: The Decans chart shows the positions of all the 36 extra Zodiacal signs in relation to the Zodiac signs and whether they are northern constellations or Southern and also shows the respective body parts connected to those constellations. Unique graphics in large scale high quality format.